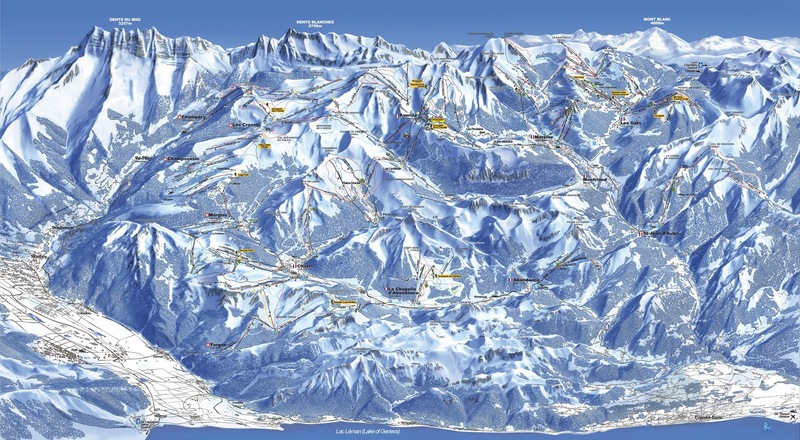 Established in 1876, Morgins ski area is part of one of the biggest ski areas in the world – Portes du Soleil ski area. That gives you the possibility to ski in 12 resorts and two countries. Situated in the Chablais region, this small ski resort is overlooking seven spectacular peaks of Dents du Midi - a legendary mountain chain visible from all over Portes du Soleil. Cross-country skiers will find 20 km of track, including the famous high-altitude track around the Lac de Morgins. Morgins will make your holiday a memorable and eventful one! Morgins is a mountain village located on the Swiss side, on the border between France and Switzerland, in the Valais region. Morgins offers the best of Swiss and French cultures and probably it is the most beautiful of the 12 Portes du Soleil resorts. In Morgins ski area you can discover the skiing around the Corbeau and Follieuse area. The Foilleuse chairlift (towards Les Crosets ski area) and the Corbeau chairlift (towards Châtel ski area in France) are serviced by a free shuttle bus. Morgins offers a variety of different types of accommodation, from classic chalets to modern hotels and guesthouses. You have a wide selection of bars and excellent restaurants in this small town. There's also a variety of after-ski activities to enjoy to enjoy both in Morgins and in the neighbouring area. Other winter activities in Morgins include a fun park, snow park, night skiing (lighted), toboggan-run, halfpipe, a natural ice track, snow go-karting, horse-drawn sledge rides, dog-sleigh rides and snow-shoe walking. Although Switzerland is well known for its efficient rail network, we still recommend you to order direct airport transfer to get to your chosen destination. If you will want to use public transport closest train station to Morgins is Troistorrents (10km and 15 minutes drive). We carefully calculate all resort transfer services individually, to ensure that our customers never overpay. Whenever you choose to travel and whatever your final destination, Alps 2 Alps will get you there for the lowest possible price. However, we advise booking early to access the best possible deal. In addition, keep up to date with Alps 2 Alps for the latest offers, deals and discounts on Morgins resort transfer services. All of the above will only ever result in our base-rate for ski transfers going down – we never over-inflate our prices at any time or for any reason. We also offer substantial discounts for off-peak, off-season and midweek transfers to Morgins. If looking for the best possible deals, travelling outside peak season or midweek typically results in the biggest savings. We offer midweek (Monday to Friday) prices with up to 60% discount than weekend prices. Your transfer quote will also depend on vehicle availability, transfer schedule, vehicle utilisation and other costs like road tolls and airport parking charges. In all instances, we work hard to keep our prices low and are relentlessly committed to total value for money. Which is why we guarantee you won’t find a better deal on your Morgins ski resort transfers, whatever your needs. The resort of Morgins lies at an elevation of 1,350m, with a max vertical of 1,470m and its highest lift going as far as 2,470m. 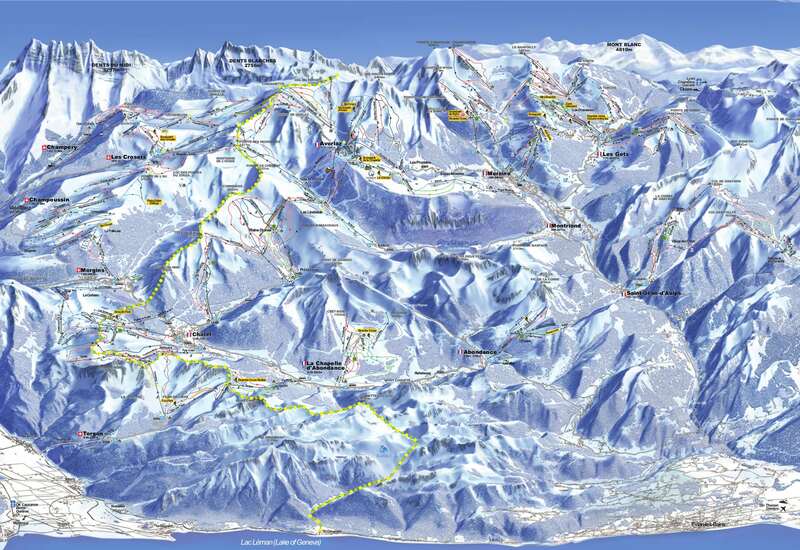 There are a total of 25 pistes in the immediate vicinity of the resort, served by 35 ski lifts. Around 25% of the slopes are ideal for beginners, 60% serve the needs of intermediates and the remaining 15% is far more challenging. That is worth to mention that with the appropriate ski Lift Pass you can ski or snowboard in the other Portes du Soleil ski resorts of Champery, Champoussin, Torgon, Abondance, Avoriaz, Châtel, La Chapelle d'Abondance, La Grande Terche, Les Gets, Montriond, Morzine and Saint Jean d'Aulps. The domain of Portes du Soleil has 400km of downhill skiing, with 285 individual pistes, served by 196 ski lifts. Many families choose Morgins for their ski holidays. There is a Morgins Ski and Snowboard School (Member ESI). M3S Baby Club offers a creche for the little ones with play areas inside and outside. It consists of a playroom with toys, a dining room and even a sleeping room! The M3S mini club is taking children from 3 years old. The way we see it, Morgins resort transfers are about so much more than getting you to your final destination. It is also the perfect way to start your holiday! After all, you also want to arrive comfortable, refreshed and ideally on time. Not all resort transfer services can promise this – Alps2Alps guarantees a higher-level service for every passenger. Keep an eye for all kinds of deals, discounts and special offers that could make your trip even more affordable. If looking to secure your seats for the best possible price, booking as early as possible is advisable. If you can’t find exactly what you’re looking for, please get in touch with the Alps2Alps customer service team today. Otherwise, go ahead with your booking and we’ll see you in the snow!